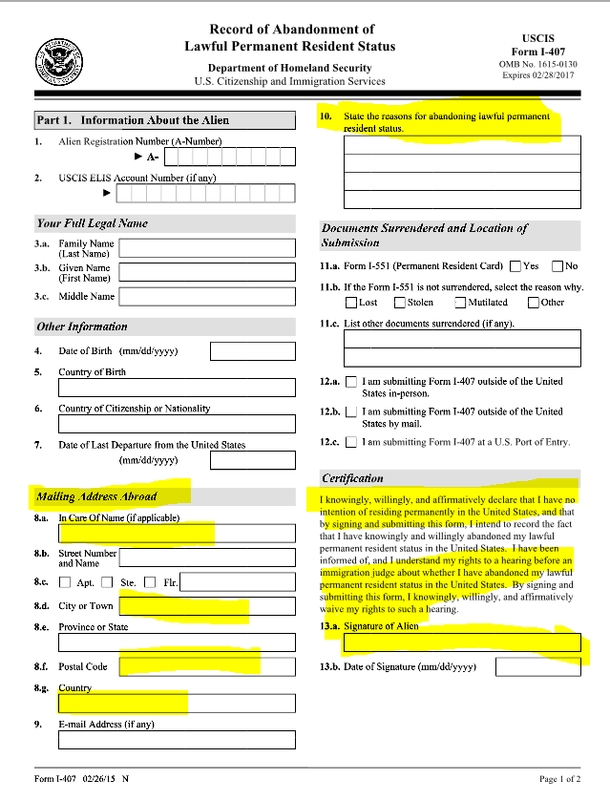 We can call this “forced expatriation”; when the government takes investigative action to deport a lawful permanent resident (“LPR); i.e., cause a forced tax expatriation where an individual files a false return, provides false information or otherwise submits a false document to the government. Other posts have discussed the role of U.S. income tax treaties in accidental “expatriation” for lawful permanent residents. See, Countries with U.S. Income Tax Treaties & Lawful Permanent Residents (“Oops – Did I Expatriate”? ), posted April 29,. 2014 and The dangers of becoming a “covered expatriate” by not complying with Section 877(a)(2)(C), posted March 9, 2014. We can call this “inadvertent expatriation”; when the individual themselves who is a LPR inadvertently causes a tax expatriation by operation of law. My goal is to provide useful information on U.S. federal tax law provisions for U.S. citizens who renounce. As this blog provides, it does not provide legal advice specific to any individual circumstances. A prior post (How Many of the 5,211 Former U.S. Citizens (who Renounced in 2014 and 2015) are Still U.S. Taxpayers?) erroneously indicated that many of these individuals continue to be U.S. persons for federal income tax purposes. This is not necessarily the case, depending upon when the U.S. citizenship terminated; i.e., when was the “expatriation date” as provided for in the statute. It is very possible that individuals who have renounced citizenship and did not certify under Section 877(a)(2)(C) are “covered expatriates” with all of the adverse tax consequences that befall that status (including to any future U.S. beneficiaries). They will not necessarily continue to be “U.S. persons” for other purposes of Title 26. I will run a series of posts over the next month or so that will discuss some of the vexing timing issues in the statute in this regard.